Pennsylvania Ballet's "Strength and Longing" features Company premieres by four choreographers, February 4-7 at the Merriam Theater. Photo by Alexander Iziliaev. 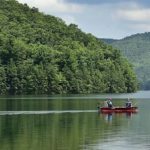 Looking for something to do this week? Robin Bloom shares her picks. 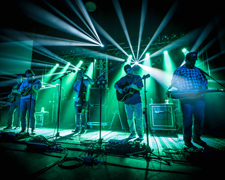 Greensky Bluegrass promises to get you excited about bluegrass. The five piece band has perfected the sound of rocking acoustic instruments and plays Union Transfer, Wednesday, February 3, 8pm (doors at 7pm), 1026 Spring Garden Street, Philadelphia. Horseshoes And Hand Grenades opens. 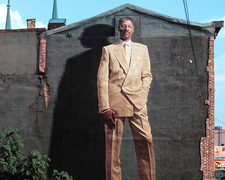 The City of Philadelphia Mural Arts Program – the nation’s largest public art program – has partnered with the African American Museum of Philadelphia to offer special mural trolley tours of the Albert M. Greenfield African American Iconic Collection, with tours by experienced guides who will discuss each mural and the mural-making process, Saturday, February 6, 10am-12pm and Sunday, February 21, 1pm-3pm. Departing from the African American Museum of Philadelphia, 701 Arch Street, Philadelphia. Photo by Jack Ramsdale. The Philadelphia Chinatown Development Corporation partners with the Reading Terminal Market for a Chinese New Year celebration, Saturday, February 6, 10am-4pm, with decorations, activities, food and more. Watch the lion dance featuring the Philadelphia Suns in front of City Hall on Sunday, February 7, 1pm and 2pm. Catch the Midnight Lion Dance Parade, Sunday, February 7, 10:30pm, 10th and Race Streets. 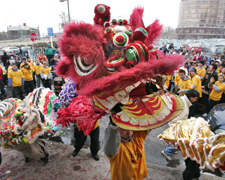 Follow the Philadelphia Suns lion dancers as they bestow good luck and good fortune with a parade, Sunday, February 14, 11am-3:30pm, with firecrackers, martial arts performances, and more, 10th and Spring Streets. Pictured: Revelers dance with dragons to celebrate Chinese New Year in Philadelphia. (AP Photo/George Widman). 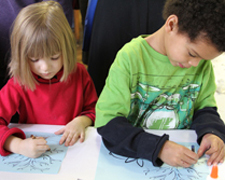 Celebrate at the Please Touch Museum February 6-8 with live music, ribbon dancing, crafts and more, Memorial Hall, 4231 Avenue of the Republic, Fairmount Park, Philadelphia. Catch the Tanglewood Marionettes with a new show, The Dragon King, Friday, February 5, 7pm. International House Philadelphia’s 16th Annual Lunar New Year Celebration takes place Friday, February 5, 7pm. Enjoy traditional musical and dance performances and a sampling of traditional Chinese cuisine, 3701 Chestnut Street, Philadelphia. Independence Seaport Museum’s annual Lunar New Year celebration is Saturday, February 6, 11am-3pm, with cultural activities from China, Japan, Korea, and Vietnam, including crafts, dancing, storytelling, calligraphy, martial arts workshops, dance performances, food, and more, Penn’s Landing, Philadelphia. The Philadelphia Museum of Art hosts a family celebration Sunday, February 7, 10am-3pm, with a performance by Dance China NY, a Chinese lantern art activity, calligraphy demonstrations, and tours focused on East Asian art, Benjamin Franklin Parkway, Philadelphia. Delaware Art Museum hosts a Chinese New Year celebration Saturday, February 20, 11am-3pm, with traditional Chinese art activities, demonstrations, dances, and more, 2301 Kentmere Parkway, Wilmington. 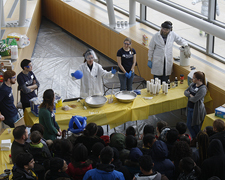 Philly Materials Science & Engineering Day offers hands-on workshops that give participants an in-depth look at how materials science is applied to solving some of today’s pressing problems, Saturday, February 6, 10am-4pm, focusing on hands-on activities related to five essential themes: communications, earth, energy, health, and sports, Drexel University’s Bossone Research Center, 3140 Market Street, Philadelphia. Free and open to the public. 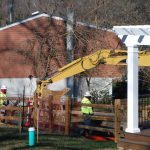 In collaboration with the University of Pennsylvania’s Department of Materials Science and Engineering, the Franklin Institute, the Academy of Natural Sciences of Drexel University, and the Chemical Heritage Foundation. Wagner Free Institute of Science hosts Wagner’s Winter Wonderland, Saturday, February 6, 12pm-4pm, an afternoon of storytelling, winter-themed arts and crafts, scavenger hunts, hands-on activities, and the opportunity to explore the natural history museum. Geared toward children ages 6-12, 1700 West Montgomery Avenue, Philadelphia. Free with registration encouraged. Photo courtesy of Wagner Free Institute of Science. Delaware Museum of Natural History shares recent discoveries and cutting-edge planetary science with Great Balls of Fire: Comets, Asteroids, Meteors, a variety of interactive, multimedia experiences, ranging from computer-based activities to a larger scale pod where visitors can play the role of explorer-in training, developed by the Space Science Institute’s National Center for Interactive Learning. 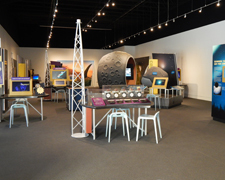 Several space-related exhibits include a high-altitude flight suit and NASA space suit, four different kinds of telescopes for stargazing, meteorite specimens, and more, through May 30, 4840 Kennett Pike, Wilmington. Photo courtesy of the Delaware Museum of Natural History. 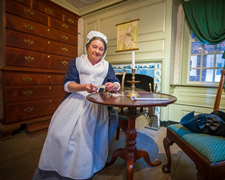 Head to the Betsy Ross House for a Historic Chocolate Making Demonstration, Sunday, February 7, 11am-4pm, and meet three female entrepreneurs and learn how women played an active role during the American Revolution with the new hands-on, interactive and immersive exhibit Women at Work in Revolutionary America, 239 Arch Street, Philadelphia. Sample the hot chocolate drink that colonists enjoyed. Fleisher Ollman Gallery presents two solo exhibitions that explore each side of the human psyche: Sarah Gamble: Vibraspace and Jennifer Levonian: Shake Out Your Cloth, February 5 through March 26 with opening reception February 5, 6pm-8pm, 1216 Arch Street 5A, Philadelphia. Pictured: still from Xylophone, Jennifer Levonian, 2016, stop-motion animation with cut-outs in watercolor and gouache. Mixed Use: Extending the Terms, works by Rutgers University – Camden Department of Fine Arts Faculty, Students and Alumni will be on display at 3rd Street Gallery, February 5-25 (opening reception Friday, February 5, 6pm), showcasing the broad and interdisciplinary range of teaching pedagogy in painting, sculpture, photography, graphic design, and animation, 45 North 2nd Street, Old City Philadelphia. Opening at Space 1026: Eland Ward’s A series of rather large drawings, a solo exhibition of large-scale works on paper by the Brooklyn-based artist that employ both line and pattern through meticulous mark-making, February 5-25 (opening reception February 5, 7pm-1pm), 1026 Arch Street, Philadelphia. Bridgette Mayer Gallery hosts the first solo exhibition with new gallery artist Damian Stamer “A little past Lake Michie,” examining landscape in rural North Carolina, through February 27 with an opening reception Friday, February 5, 6pm-8pm, 709 Walnut Street, 1st Floor, Philadelphia.The Barnes Foundation’s First Friday! Affairs of the Art celebrates Valentine’s Day early with the music of trumpet player and singer Jumaane Smith, formerly a member of Michael Buble’s band. The Juilliard alumnus performs music from his debut record, I Only Have Eyes for You, a celebration of the Great American Songbook, followed by a short talk on Barnes’s relationship to the African American cultural community in Philadelphia and the opportunity to view the collection, Friday, February 5, 6pm-9pm, 2025 Benjamin Franklin Parkway, Philadelphia. Catch Art Loop in Wilmington, Friday, February 5, 5pm-9pm, featuring exhibition openings for Lynda Schmid, Amy Stevens, and studio artists Dan Jackson and Ken Mabrey, Delaware Fun-A-Day’s exhibition of work by over 100 Delaware artists, performances by City Theater Company’s Fearless Improv, DJ Skinny White, live music and more, the Delaware Center for Contemporary Arts, 200 South Madison Street, Wilmington. Go on an emotional journey with the Pennsylvania Ballet and four different choreographers with Strength and Longing. Company premieres include Nacho Duato’s Without Words, highlighting themes of life and death through six stripped-down instrumental compositions by Franz Schubert. 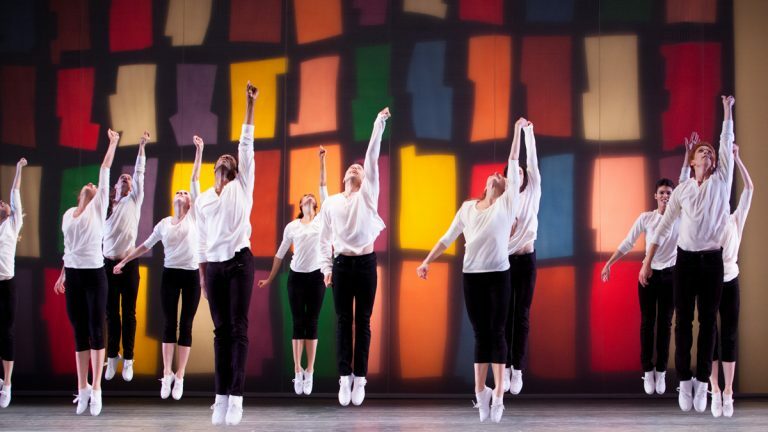 Jerome Robbins’ NY Export, Opus Jazz is an abstract ballet, set to cool jazz that reflects the post-war era of New York City streets. Also, Christopher Wheeldon’s For Four, a work created in California in 2006 and performed to Schubert’s “Death and the Maiden” quartet. 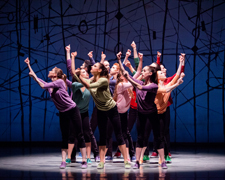 Finally, the company’s first ever piece by Justin Peck – Chutes and Ladders – set to Benjamin Britten’s String Quartet No. 1 in D Major, with five performances February 4-7 at the Merriam Theater, 250 South Broad Street, Philadelphia. Photo by Alexander Iziliaev. Ezralow Dance makes its Philadelphia debut at the Prince Theater, February 3-7, as part of the NextMove series presented by Dance Affiliates. Under the artistic direction of Daniel Ezralow, choreographer for the Academy Awards, 2014 Sochi Winter Olympics and Broadway’s Spider-Man: Turn off the Dark, the Los Angeles based company known for its explosive physicality, humor and inventive choreography presents a 75 minute full-length dance work, “Open,” consisting of 15 choreographic vignettes set to a classical music score of works by Bach, Beethoven, Chopin and others, 1412 Chestnut Street, Philadelphia. 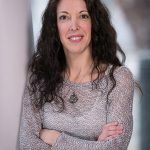 Related events include two post-performance chats, plus a student discovery performance on Friday, February 5, 10:30am and a free master class on Friday, February 5, 1pm, University of the Arts, 211 South Broad Street, Philadelphia. 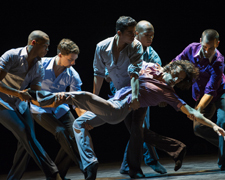 Ballet Hispanico, led by Artistic Director Eduardo Vilaro, known for fusing Latin roots with an eclectic, sleekly modern style, comes to Annenberg Center Live for three performances, February 5-6. Program includes Sombrerísimo, an exploration of identity that references the surrealist world of the Belgian painter René Magritte. Bury Me Standing, created by Spanish choreographer Ramón Oller, showcases the unique culture of the Gypsy or “Roma” people, and Flabbergast uses humor to expose our stereotypes and preconceived ideas about new and foreign places, 3680 Walnut Street, Philadelphia. Photo by Paula Lobo. 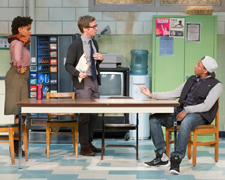 Onstage at Philadelphia Theatre Company is Exit Strategy by Ike Holter. The gripping and timely (for Philadelphia) play takes place in a dilapidated public school in Chicago targeted for closure and the power struggles that ensue among the faculty and students desperate to keep it open. 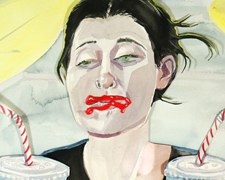 A co-production with New York’s Primary Stages, the show is directed by Kip Fagan and stars an ensemble cast including Michael Cullen, Aimé Donna Kelly, Rey Lucas, Deidre Madigan, Christina Nieves, Brandon Pierce, and Ray Spahn, through February 28. 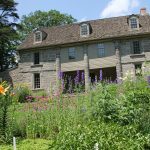 Related events include Philadelphia Young Playwrights, Meet-the-Artists Talk Back, Backstage Tour and more, Broad and Lombard Streets, Philadelphia. Photo by Mark Garvin. To Kill a Mockingbird is onstage at Media Theatre, the play based on the classic book by Harper Lee. 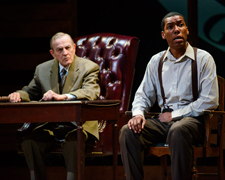 The drama has been extended through February 21, directed by Jesse Cline and starring Robert Stineman as Atticus Finch, 104 E. State Street, Media, PA. Pictured: Keith Travis Battle as Tom Robinson, with P. Brendan Mulvey as Judge Taylor. Photo courtesy of Media Theatre.